As much as I love my CR120H, I have been craving a secondary amp, as well as a mod platform, and a member on another forum asked if I had any non Orange/non solid state amps in my future. (I always recommend them over there). 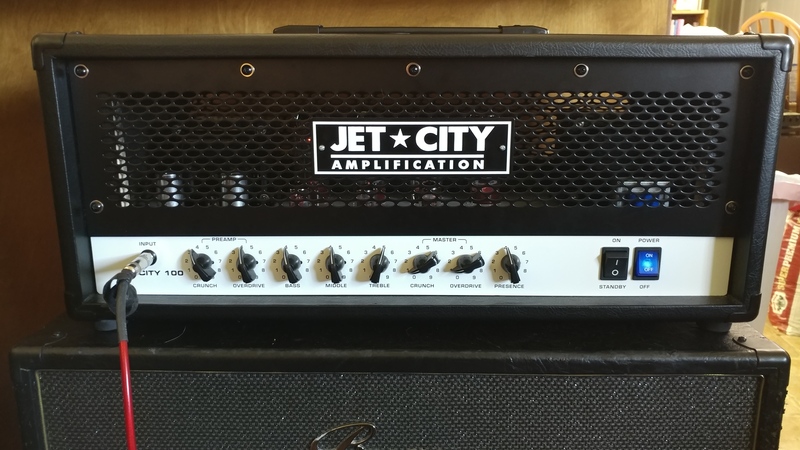 I got to thinking, and ordered myself a Jet City 100 LTD.
100 watt, EL34 output, and a stupid simple layout for working on. This thing sounds vicious! Crunch channel gets a good jcm800 crunch and a boost turns it into a thrash machine, and the overdrive channel has more than enough gain for anything. I can't decide which amp I like better, my Crush, or the JCA... I need another cab to run both in stereo! Anywho, here is a pic. My cat loves the Orange tone!